Happy hump day, lovelies! As I mentioned on yesterday's post, layering for Fall is key. I wore this look over the weekend while road tripping up to Asheville for the night and it was the perfect choice. Cool enough for during the day and warm enough for when the sun went down. A swing dress really is the perfect piece for learning to layer (And this one is less than $70!). Jackets, scarves, ponchos - anything can be added to them to cozy-up (is that a real phrase?) the look a bit. And, you can wear them with a flats, heels or boots, so that's a major plus! A utility jacket is such a closet staple and also perfect for layering on top of almost anything! If you haven't picked one up for Fall/Winter, this one and this one are my current faves, plus my scarf is on sale! Fantastic bag and scarf! I like the way you've styled this outfit! Love the grey and military green combo! SO adorable! Obsessed with your outfit. Perfect for the fall! This outfit is so perfect for fall and I love your glasses! What a beautiful look. I LOVE the jacket. Love your jacket and scarf!! I love all the light coloured you used! Looks great on you! I love that you styled a neutral look with accents like tassels and fringe. Flawless! Beautiful color palette! Love the cool tones. 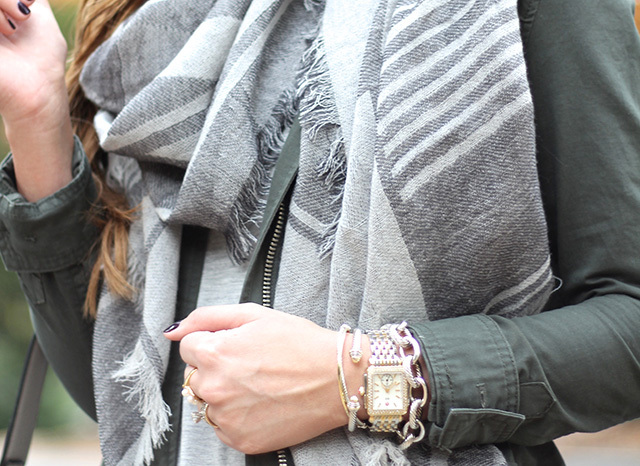 Great way to layer, nice look! Love this dress paired with the rest of the outfit.